3 Ways to Prevent Cavities in Children - Children really like sweet foods, such as candy, cotton candy, ice cream, milk, and so on. However, sometimes children forget to brush their teeth after eating sweet foods. 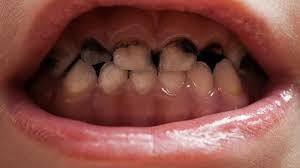 This triggers the growth of bacteria on the teeth and the child's teeth become hollow. This little thing is sometimes forgotten by children and parents, then realized after the child's teeth are hollow. Come on, try to look at your child's teeth. Normally the surface of the tooth is covered with dental plaque. Bacteria on dental plaques metabolize sugar from food and produce acid. Keep in mind, sugar is the food of bacteria. This acid will then erode minerals from the surface of the tooth or commonly called enamel. On the other hand, saliva or saliva consisting of calcium and phosphate will reduce the acid that attacks the teeth by neutralizing and preventing it from removing minerals from the teeth. However, saliva requires sufficient time to do this. If your child continues to eat and drink, especially those containing sugar, saliva will not have enough time to do the work. The bacterial cycle produces acid and then saliva helps to reduce acid will continue. Because too much acid is produced, saliva does not have enough energy to fight it and eventually, the minerals on the tooth surface will erode. White spots on the teeth will then appear, indicating the mineral teeth have disappeared. This is the first sign of cavities. The development of cavities can be stopped at this time. The tooth surface can improve itself by using minerals from saliva and fluoride from toothpaste. However, if the missing minerals remain irreversible, the process of going to cavities will continue. Over time, the surface of the tooth will weaken and break down, forming a hole. Cavities occur because of loss of minerals in the teeth caused by bacteria. These bacteria produce acids that will erode the surface of the teeth. Actually, saliva in our mouth has worked hard to keep our teeth from bacteria and acids. However, because the food we eat is quite large, saliva needs help to do its work. Brushing your teeth regularly using toothpaste containing fluoride is important to prevent cavities. Fluoride can prevent cavities by preventing mineral loss from tooth surfaces, replacing minerals lost to teeth, reducing the ability of bacteria to produce acids. Brushing your teeth should be done twice a day, namely after breakfast and before going to bed. During sleep, only a little saliva is produced, so brushing your teeth before going to bed helps your teeth repair themselves from acid. There is no need to add toothpaste to children under 2 years of age when brushing their teeth, just enough water to brush a child's teeth at this age. For children aged 2-6 years, you should give toothpaste to a child's toothbrush. Give only the size of bean seeds, not too much because it will also damage the child's teeth. Teach children to throw toothpaste after brushing their teeth and not get swallowed by children. High fluoride content in children's toothpaste if ingested by children will cause fluorosis. Children under the age of 6 usually tend to swallow toothpaste when brushing their teeth, especially the sweet and fruit-like toothbrush makes him want to swallow it. If the child cannot brush his own teeth, you should help brush your child's teeth. Try to help your child brush your teeth at the beginning of brushing your teeth and let him continue on his own. Food greatly affects the child's dental health. Foods and drinks that contain sugar trigger bacteria to produce acid from the sugar. This acid then erodes the minerals on the surface of the tooth. Although saliva can fight acid, if too much acid is produced by bacteria, saliva is unable to cope with it. Therefore, you need to pay attention to what foods and drinks your child eats and how often children eat and drink sweets. One thing that is often overlooked is whether children brush their teeth after eating or drinking sweet, this is very important to do to prevent cavities especially if your child likes sweet ones. Make sure the child does not eat again after brushing before going to bed. It's best to give your child time to enjoy the sweet snacks, between the main meals. This is useful to reduce the habit of children eating sweet foods continuously and also to give time for saliva to repair teeth. Don't forget to always check your child's teeth regularly to the dentist, at least once a year. This is done to maintain the health of the child's teeth so that if there is damage to the child's teeth, it can be known as early as possible. Gently explain to the child that they need not be afraid of the dentist.